“Rediscovering the Art of Preaching” is the title of the 22nd Annual Theological Symposium, to be held Sept. 20-21 on the campus of Concordia Seminary, St. Louis. The main presenters for the event are Dr. Dean Nadasdy, Dr. Dale Meyer, Dr. David Schmitt, and Dr. Glenn Nielsen. Sectional presenters include Seminary faculty members David Maxwell, David Peter, Tony Cook, Glenn Nielsen, David Schmitt, and Jeffrey Gibbs. Additional sectional presenters include David Coe, Justin Rossow, and Ed Grimenstein. While the heart of preaching is familiar conversation for Lutherans, the art of preaching may be a bit stranger speech. Caemmerer’s Preaching for the Church was published in 1959 and, in many ways, has shaped our discussion of preaching. Much has changed since then, both in the world and in homiletics. The discipline of homiletics has grown, interacting with various cultural settings, exploring new methods, and incorporating new insights. How can we learn from these conversations, reflecting on the art so that we better communicate the heart of preaching? The 2011 Theological Symposium will address this question. “Rediscovering the Art of Preaching” explores recent developments in homiletics, inviting participants to rediscover the art of preaching while preserving the heart of faithful proclamation. Full registration is $130 per person ($140 after Sept. 6) and includes program materials, Tuesday’s buffet reception, and refreshments. Other registration fees come at ala carte pricing. In conjunction with the Theological Symposium, Concordia Seminary will host its Day of Exegetical Reflection on Monday, September 19, from 9:00 a.m. to 4:15 p.m. in the Seminary’s Clara and Spencer Werner Auditorium with the theme “The Bible in English: Its Present and Future.” The event is designed for pastors, students involved in exegetical education and others interested in the proclamation of the Gospel in today’s world. The registration fee for the Day of Exegetical Reflection is $25. Dr. Andrew Steinmann and Dr. David Trobisch will be the main presenters for the event. Andrew Steinmann is professor of theology and Hebrew at Concordia University Chicago. He holds a B.S. from the University of Cincinnati, an M.Div. 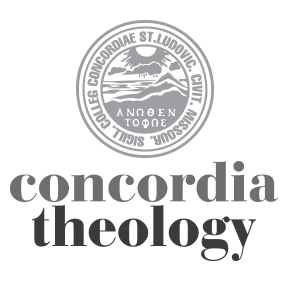 from Concordia Theological Seminary and a Ph.D. in Near Eastern Studies from the University of Michigan. He has served as a parish pastor, a Bible translator, a nursing home chaplain and as a professor at several institutions of higher education. Dr. Steinmann is the author of 11 books, including three commentaries in the Concordia Commentary Series. He also served as a consultant for The Lutheran Study Bible. His current project is an Old Testament isagogics textbook co-authored with Dr. Reed Lessing to be published by Concordia Publishing House. David Trobisch was born in Cameroon, West Africa, as the son of missionaries. He grew up in Austria and studied theology in Germany. He taught New Testament at the University of Heidelberg, Germany, Missouri State University, Yale Divinity School and Bangor Theological Seminary (Maine). He now lives in Springfield, Mo., and Nussloch, Germany. Dr. Trobisch is internationally recognized for his work on the letters of Paul, the formation of the Christian Bible, and Biblical manuscripts. For more information and/or registration information, contact the office of continuing education and parish services at 314-505-7486 or ce@csl.edu, or visit the Seminary’s website at www.csl.edu.